A new GTK2/GTK3/GNOME Shell theme pack has been released: Drakfire Dream Suite. Having a theme that supports both GTK2 and GTK3 applications is pretty important because not all applications support GTK3 yet. So for instance if you run Ubuntu 11.10 or Fedora 15, you still have applications like Rhythmbox, GIMP, Shotwell and lots more that use GTK2. 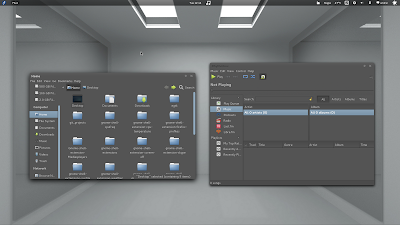 The theme uses Unico and Adwaita engines for GTK3 and Murrine engine for GTK2 so make sure you have all these GTK engines installed before trying to use the theme(s). To install Drakfire Dream Suite, download it, extract the archive and copy "drakfire dream" and "drakfire dream black" to the ~/.themes folder (this is a hidden folder in your home directory so press CTRL + H to see it; if the folder doesn't exist, create it). For Ubuntu 11.10, that's all you need to do. There are some Unico Fedora 15 rpm files available at GNOME-Look, but it's not a good idea to download pre-compiled packages from untrusted sources so use it at your own risk! For Arch Linux, there's an AUR package available @ https://aur.archlinux.org/packages.php?ID=51286. Once everything is set up, use GNOME Tweak Tool to apply the theme.